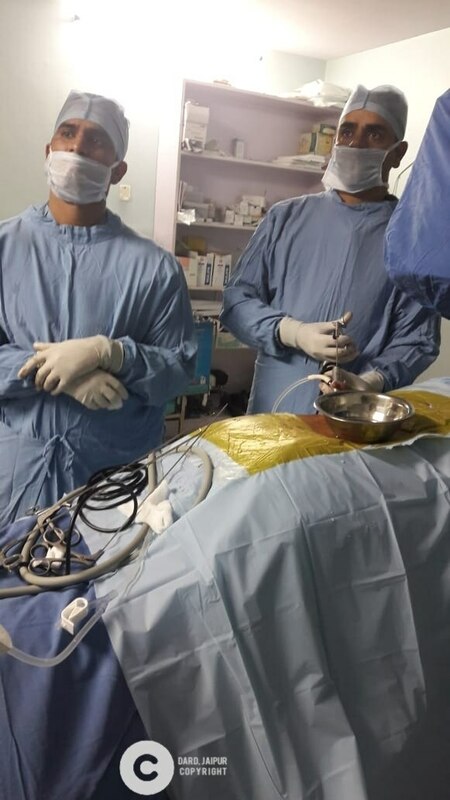 Patient , from Afghanistan, for Endoscopic Discectomy A patient, 52/ M, from Afghanistan had a Complain of Low Back Pain with Radiating pain in left lower side from last two month. The severity of the pain made him unable to walk even for 200 meters. His SLR on left side was only 20 degree. His MRI shows L5_S1 prolapsed disc with lateral canal stenosis on left side. He was advised for open surgery but he was not interested because he already got operated twice for L4_5level 2 year and 6 month back for same type of problem. He contacted us at Royal Orthopaedic Hospital , Jaipur . We adviced him latest technique Endoscopic discectomy (TSSULA)Trans Foraminal Spine Surgery under Local ANAESTHESIA. He agreed and thereafter, we did L5_S1 Tssula. The patient is very happy because he found no pain after the surgery. Now his SLR left side is 90 degree. Only 8mm Incision is made. There is no need of general Anaesthesia .From the next day of surgery, He could walk comfortably without pain. He was discharged from the hospital very next day after this major surgery. The patient couldn't believe this because he compared all the things with previous surgery (for the same type of problem).